Treacle, born on April 19, 2001, was bred by Mary & Brendan Fitzpatrick in Ireland and bought for 54,000 euros by bloodstock agent Jeremy Brummitt at the Tattersalls Ireland Derby Sale in 2004. He went through the same ring again in 2005 for 36,000 euros. The John Smith’s Grand National has been the aim for Treacle ever since he became the property of Bjorn Nielsen who was inspired by watching Red Rum beat Crisp in the 1973 Grand National. He finished eighth on his debut for trainer Tom Taaffe in a bumper at Gowran Park in February, 2006, and filled the runner-up spot on all three of his first starts over hurdles – at Fairyhouse, Killarney and Wexford. He lost his maiden tag with an emphatic 15-length victory at Cork in December, 2006, and ran respectable races in Grade Two company on his next two appearances at Naas and Fairyhouse, before ending his season with a good third in a competitive novice hurdle at the Punchestown Festival in April, 2007. Treacle was sent chasing for the 2007/2008 campaign and he recorded a comfortable success on his second start over fences at Fairyhouse in October, 2007. A leg injury sustained during that victory forced Treacle to miss the rest of the season and the majority of the following campaign and he finished third on his return to action in a Limerick handicap chase in March, 2009. 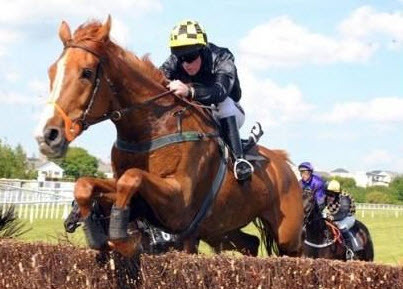 Treacle fell on his next outing in another handicap chase at Fairyhouse the following month but he made amends with a comfortable success in a Listowel handicap chase in June, 2009. He followed up that win with another victory as he gamely repelled the challenge of Dashing George to take the Munster National at Limerick in October, 2009. Raised 8lb for that win, Treacle struggled on his next four starts as he came home a well-beaten sixth after being hampered at the first fence in the Troytown Handicap Chase that November and was pulled up on his next three outings at Leopardstown, Punchestown and Cork. Treacle was given a break after taking fifth in a handicap chase at the Punchestown Festival in May, 2011, and he made a winning return at Gowran Park in October of the same year as he comfortably took a three-mile handicap chase. After a satisfactory performance in a veterans’ chase at Aintree over the Mildmay course, he came home second in the valuable Paddy Power Chase at Leopardstown over Christmas but produced a career best performance when third in the Grade One Irish Hennessy Gold Cup at the same course in February, 2012. He went for the 2012 John Smith’s Grand National on the back of that run but got no further than the 10th where he fell. The 12-year-old has had a lighter campaign this season, finishing seventh of eight in a chase at Thurles over two and a quarter miles on February 28, before a decisive four length victory in the Daily Mirror Chase at Down Royal over three and a quarter miles on heavy ground on March 16. Although based at Greenwich in Connecticut, USA, Bjorn Nielsen was born in Cape Town, South Africa, and grew up at Epsom in England, where he attended grammar school. He maintains strong ties with Britain and has stated he prefers the variety of racecourses in Britain compared to the USA. He, wife Debbie and their three daughters are longstanding American residents and he has been highly successful in the finance world, serving as managing director of Tudor Ventures, a private equity and venture capitalist firm. He has been with the Tudor Investment Corporation for 24 years. Nielsen has been a major investor in horses for many years, using agents such as Jeremy Brummitt, Tom Goff and Charlie Gordon-Watson, and bloodstock advisor Simon Marsh. He was represented in the 1992 Derby by the Richard Hannon-trained Assessor, who finished ninth behind Dr Devious and went on to win the Group One Prix Royal-Oak and Group One Prix du Cadran in France. Other flagbearers include the Roger Charlton-trained Tante Rose, whom he bought for 350,000 guineas at Wafic Said’s dispersal in 2003 and won the following year’s Group One Sprint Cup at Haydock, and the 2011 Ladbrokes St Leger victor Masked Marvel, trained by John Gosden. Nielsen bought the Kingsdown training centre in Lambourn in late 2009, with David Lanigan moving into the renovated stables in December, 2011. Most of the owner’s Flat string, of whom he had around 25 in 2012, are with Lanigan, although he still has horses with Gosden. Long-term breeding prospect Dorcas Lane was bought for 475,000 guineas in November, 2011. Nielsen has around a dozen broodmares at Lord & Lady Lloyd-Webber’s stud farms in Britain and Ireland. He is a keen tennis player. Tom Taaffe, who was born on June 15, 1963, is son of the peerless Arkle’s legendary jockey Pat Taaffe, who rode two Grand National winners in Quare Times (1955) and Gay Trip (1970). Tom took a giant stride into the limelight in 2005 thanks to his impeccable handling of Betfred Cheltenham Gold Cup hero Kicking King. Taaffe spent his schoolboy summers working for Arthur Moore and forged an association with the trainer that lasted 15 years, first as an amateur rider and then as a professional jockey. He rode his first winner at Phoenix Park in 1981 and enjoyed a successful career in the saddle as a jump jockey, partnering 400 winners. He finished third in the 1988 Grand National aboard Monanore and began training from Portree Stables near Straffan in County Kildare in 1994. In 1998, he enjoyed his first Grade One triumph with Delphi Lodge in the Powers Gold Cup at Fairyhouse. Kicking King’s Gold Cup success, combined with his earlier King George VI Chase victory, enabled Taaffe to emulate his father, who saddled Captain Christy to victory in the same two races. Apart from Kicking King, Taaffe has also enjoyed success at the Cheltenham Festival with Finger Onthe Pulse in the Rewards4Racing Investments Novices’ Handicap Chase and Ninetieth Minute in the Coral Cup. He won the 2010 Galway Plate with Finger OnThe Pulse. He has saddled four runners in the John Smith’s Grand National including Slim Pickings, who was beaten two lengths in total when coming home third behind Silver Birch in 2007 and finished fourth behind Comply Or Die 12 months later.